April 2019- The Mini Vinnies visited St Pio Friary to donate food items for the homeless. April 2019- The Mini Vinnies have raised money during Lent by holding an Easter Egg raffle in school. They then visited the Bradford Royal Infirmary to donate their cheque of £200! This money will go towards the 'Rays A Smile' Campaign to refurbish the Radiology department to make it more child friendly. Well done Mini Vinnies! April 2019- Congratulations to our children who made the Sacrament of Reconciliation. We are so proud of you! March 2019- As part of Interfaith week, our Year 3 and 4 classes visited a Mosque in Bradford. They learned lots about the Islamic faith and were amazed at how big the Mosque was inside! 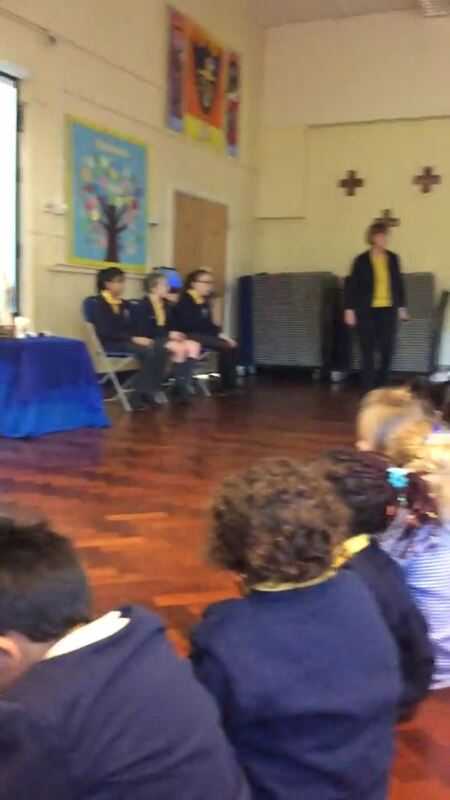 March 2019- Year 4 led us in a very moving Lenten Liturgy. Well done Year 4, you did yourselves proud! February 2019- On Wednesday 13th February the whole school took part in Creative RE day. Classes buddied up and worked on parables. We had a great day! February 2019- Some of our Year 6 children and Y7 leavers received the gift of the Holy Spirit in Confirmation. We are very proud! Week beginning 28th January 2019- This week we made our Christingles in class. Year 1 led us in a wonderful Christingle Liturgy on Friday 1st February and we let our lights shine. December 2018- We have had a busy week this week with Nativity performances from Nursery, Reception and Key Stage 1. What little stars! They have put Christ at the heart of their Nativity productions and reminded us of the true meaning of Christmas. 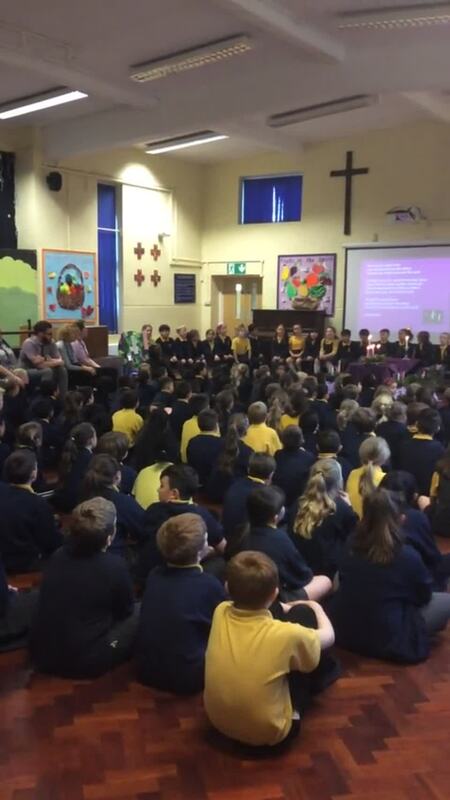 November 2018- Well done to Year 3 for leading us in a wonderful Advent Liturgy. October 2018- On the last day of the half term, Year 2 led us in a wonderful harvest liturgy. We gave thanks for the food we eat and said prayers those less fortunate than ourselves. The Friars from St. Pio Friary joined us and collected our many donations for the needy of our City. Thank you all for your kind donations. October 2018- We had the pleasure of having the Rise Theatre Company in school. The day was an exciting creative RE day based on the Parable of the Mustard Seed. The day was based on the parable of the mustard seed (Matthew 13:31-32). The whole school were Gardeners, Explorers, Warriors and Creators. The day was a reminder that we are the tiny seed that grows with the love of Our Blessed Lord. He nurtures and cares for us and with this care we flourish as Disciples of Christ. October 2018- We took part in 'One million children praying the Rosary' campaign on 17th October. Our Lady of Fatima, pray for us. September 2018- A member of staff for nearly 30 years and now confirmed into the Catholic Church today during whole school Mass. Congratulations to you. Love and prayers from your school family. September 2018- Congratulations to our Mini Vinnies who were commissed and recommissioned by Bishop Marcus at Leeds Cathedral on Friday 14th September. They are now ready to take up the cross for others in their work. July 2018- What a great turn out for the Parish Summer Fair. With your help and support the Parish managed to raise an amazing £1,985.67. June 2018- We welcomed Tamar Yellin from the Inter Faith Centre in Bradford. She came to speak to KS2 and teach them about Judaism. Our children learnt so much. We are a school of many faiths but one big family of Christ. June 2018- Our Mini Vinnies were joined by the Parish Representative for the SVP. Lots of productive ideas were discussed. Well done to our Mini Vinnies who donated their own money to sponsor a child to go to school in India. On Wednesday 13th June we celebrated our school Feast Day. The celebrations began with a whole school Mass, followed by a picnic lunch. To end our special day we enjoyed an entertainer. We had a great day! May 2018- On Friday 18th May we celebrated the feast of Pentecost and had a picnic and ice creams outside! We then had our May Procession in the afternoon and crowned Our Lady as the Queen of the May. May 2018- Mrs Bannister, Mrs Partridge and some of our Mini Vinnies attended the Good Shepherd Mass at Leeds Cathedral and represented our school. They also delivered our donation as a result of Lenten fundraising events. March 2018- Our final act of Holy Week as a school family. Year 5 led our Parents/Carers in an emotional Stations of the Cross. March 2018- On Thursday 22nd March our Year 3 children made their Sacrament of Reconciliation in Church. Congratulations! March 2018- On Monday 19th March our Mini Vinnies purchased and donated toys for sick children on the Acute Children's Ward at the Bradford Royal Infirmary. They used money raised from an Easter egg raffle that they arranged all by themselves. Well done! March 2018- Some of our children have been Baptised this month. Congratulations- you are officially Catholic! March 2018- Year 4 led us in the Lenten Liturgy. A fantastic end to a wonderful week. March 2018- On Friday 16th March the children wore their 'hats for St Pat' in exchange for £1. We raised £200 which will be donated to St Patrick's Mission in Bradford for repairs to St Patrick's Church. March 2018- On Thursday 15th March our Year 5 children visited Clayton Baptist Church to attend their Re-wind to Easter event. They worked on creative RE activities. Clayton Churches working together. March 2018- On Friday 9th March we held a Spring Fair/ Mad March Hair Day in school. We raised over £400! This will be combined with money raised from our remaining Lenten almsgiving and then divided between CAFOD, Catholic Care and St Pio Friary. February 2018- We came back to school to an action packed Mission Week! The theme was 'Being a Light of Christ- Knowing Jesus'. The Sion Community for Evangelism have worked tremendously hard with our children and the children have responded wonderfully. We were joined by Parents/Carers for assemblies, presentations and Mass. We enjoyed the week as a school community. February 2018- On the last day of the half term the children took part in a 'Let Your Light Shine' workshop by Rise Theatre. They used their gifts and talents. February 2018- Our Reception Class visited Rowanberries Care Home to make a difference in the community. February 2018- We invited Parents and Carers to join us for a Coffee Morning where they could view and discuss our new RSE resources. February 2018- Year 1 led us in a wonderful Christingle Liturgy. Thank you to Father Simon for supporting us and all the Parents/Carers who celebrated with us. Let your Light Shine. December 2017- Our Mini Vinnies visited the residents at Rowanberries Residential Home to deliver food hampers and put up a Christmas Tree! December 2017- We asked all our children for donations of new toys for seriously ill children who would be spending Christmas in the BRI. Our Mini Vinnies then delivered the toys to the Children's Ward who were so thankful. We made a difference this Christmas. December 2017- Some of our Mini Vinnies visited St Pio friary to take food donations for the needy of our city. Thank you all for your generosity. November 2017- Our Mini Vinnies met the Parish representative for the SVP. They are looking forward to making a difference together. 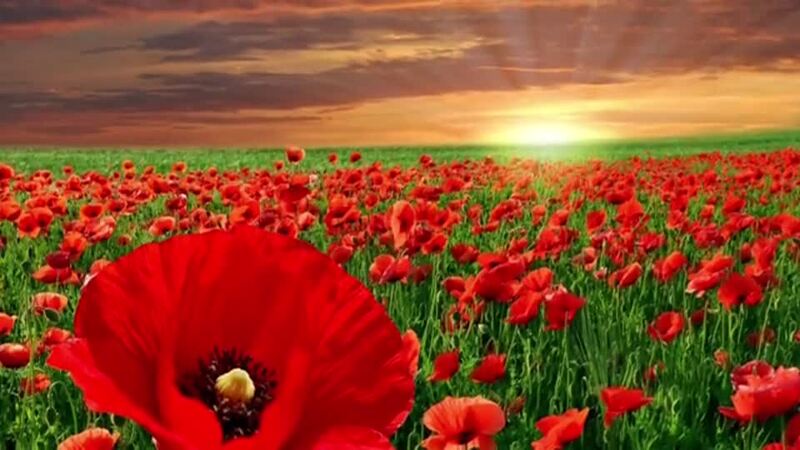 On Friday 10th November 2017, Year 6 led us in a moving and reflective Remembrance Liturgy. On Tuesday 31st October our Mini Vinnies were recommissioned. They will be great role models. On Wednesday 18th October we took part in the 'One million children praying the Rosary' campaign. 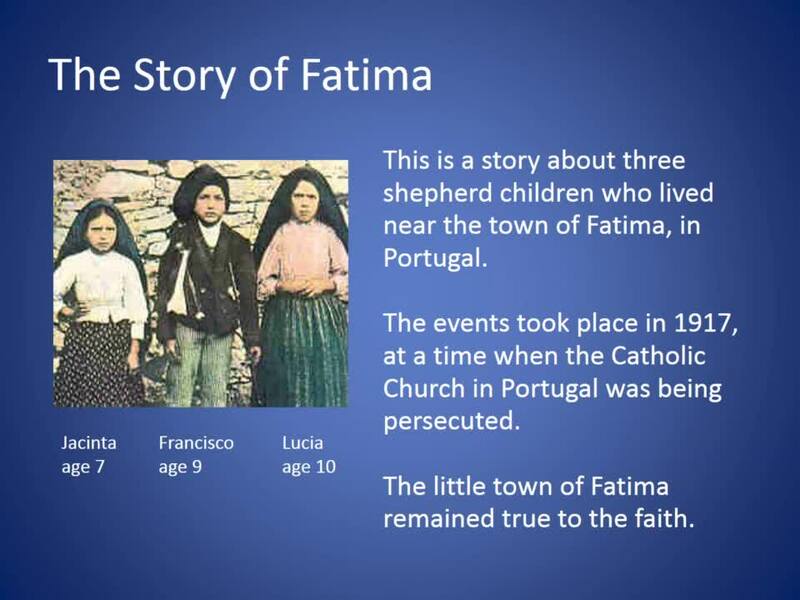 As a school family we heard The Story of Fatima and prayed the Rosary and prayed for peace in the world. We are so lucky to have children that produce work like this.